Comic Art Community: Before discussing Wrestlers in Space, would you share a bit about yourself and Francesco Chiappara? I understand Francesco produced the cover for the latest issue of your book The Vagabond, was that your first collaboration? Nathanael Hopkins-Smith: I’ve been into comics since I was a kid, my older brothers collected a variety of different titles, so I was always exposed to the medium. If I wasn’t reading them, I would be watching the animated series on TV like Spider-Man, X-Men, Batman, etc. My first comic The Vagabond is based on a short film I shot and produced in high school as one of my Visual Arts assignments. After high school, I studied TV & Film Production. While at film school it dawned on me, the complexities of producing a film, the man hours, the money, the legalities, the list goes on. I had a plethora of stories that I wanted to share with the world and I never thought it would be plausible for me to produce comics at the capacity I am today, until I had completed film school. 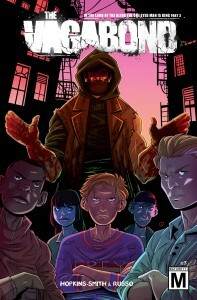 Since making the decision to pursue self publishing my stories in the comic form, I have not looked back. I’ve been writing comics since 2013 when I first launched The Vagabond, a comic about a homeless vigilante, I released the third issue a couple of months ago. I discovered Francesco Chiappara on DeviantArt and I commissioned him for the cover art for #3 and #4, this was our first collaboration. I really enjoy his art style and thought it would be perfect for Wrestlers in Space. Francesco is an up-and-coming artist from Italy, his repertoire consist of a comic through Ape Entertainment for The Croods and his creator owned series 666 il male dentro. 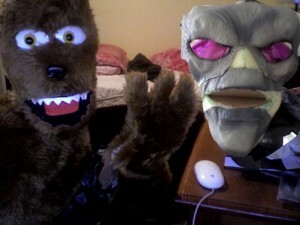 I look forward to working with him again on the second issue of Wrestlers in Space. CAC: Wrestlers in Space is said to feature four wrestlers (Commander Columbus, Rami Rasheed, and the Lobo Brothers) lost in space trying to find their way back to Earth. What details could you provide us about the story and how does Roswell and the Australian Federal Police play into it? NHS: Without giving too much away, ‘The Greys’ are the antagonist to the series, they may or may not be the cause for our wrestlers inadvertently getting lost in space, and when the Australian Federal Police eventually show up, they will be trying to clean up the trail of chaos left behind by The Roswell Greys. CAC: In addition to the main story of Wrestlers in Space, you also have the six page story “Wrestlers In Space: Origins” which is drawn by Sarah Harkey (BoJack Horseman) and features a pin-up by Spümcø co-founder Jim Smith (co-creator of The Ren & Stimpy Show and The Ripping Friends). Could you share a little bit about this story and the involvement of Harkey and Smith in the project? NHS: As a kid I grew up watching Ren & Stimpy with my dad. I wasn’t exposed to The Ripping Friends until I was in my late teens. I thought to myself if Wrestlers In Space ever got made into a cartoon, it would be great to see the wrestlers in that signature wacky John K style, so I found Sarah Harkey on DeviantArt and commissioned her to do the first six pages of the origin story, after she finished the pages, Sarah put me in contact with Jim Smith. I approached Jim and he was more than happy to get on board with this project, which I was ecstatic about. I mean imagine that, having the opportunity to work with someone of Smith’s caliber is quite an honor. Each issue contains an extra six page story, languidly paced at explaining why the wrestlers got themselves into such a predicament. #1 exhibits work by Sarah Harkey and Jim Smith. #2 features the work of Australian local Dean Rankine, his creator owned series Itty Bitty Bunnies, as well as working on The Simpsons comic and shorts for Mad Magazine, made Rankine the best fit for the short stories in Wrestlers in Space to be in his unique cartoony style and a fun opposite as the main story of each issue is in a more traditional comic style. 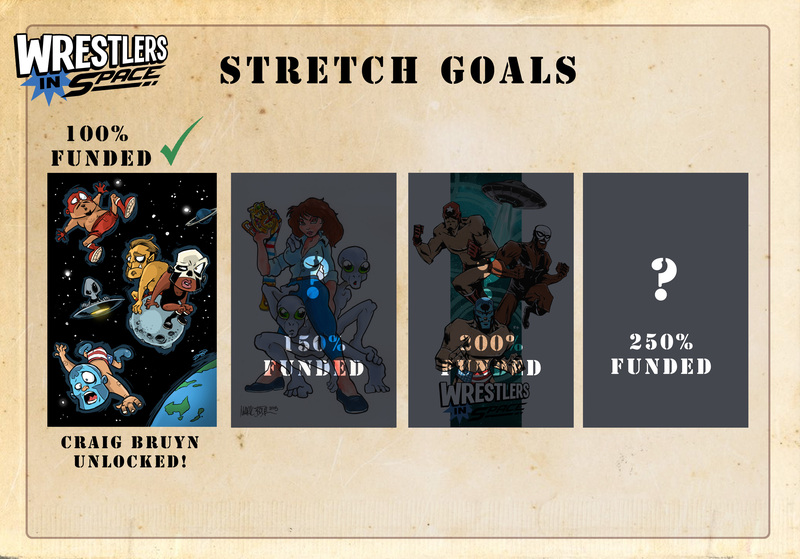 CAC: Wrestlers in Space met its funding goal on Kickstarter in its first week which unlocked stretch goals for the project. Would you discuss these stretch goals and what kind of rewards are being offered over the course of the campaign? NHS: It’s quite an achievement to have made funding in the first week; we recently launched stretch goals with some really cool guest artists, the first being Craig Bruyn, which was automatically unlocked for reaching 100%. Craig Bruyn is a local Aussie creator best known for his hit series From Above. The second stretch goal features Mark Bode, he’s a veteran comic artist from U.S.A, not only is he the son of Underground Comics legend Vaughn Bode, he has a huge body of work including Cobalt 60, Miami Mice, and The Lizard of Oz. He’s also worked for Heavy Metal and TMNT. The third stretch goal artist is Bernie Gonzalez also from U.S.A, he’s best known for his book Midnight Mystery. I discovered Gonzalez on Instagram, his amazing pulpy style caught my eye and I had to put in the book. The final stretch goal artist is Michelle Linder; Linder had previously worked for the Australian branch of Disney as an animation artist. Currently we both work at the same TV station and I begged her to get on board with this project. If all the stretch goals are fulfilled, each artist’s pin-up will be displayed in the back of the book. 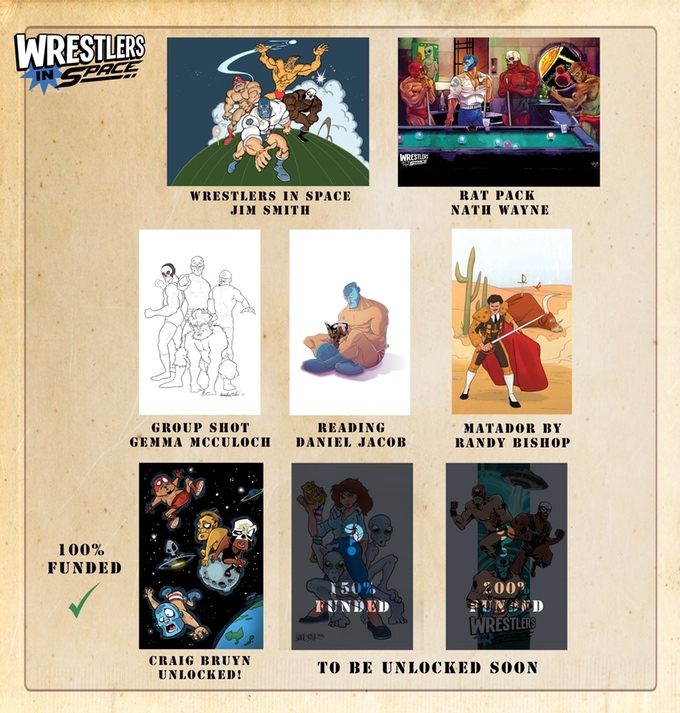 We still have lots of rewards available for the campaign, from $4 you can get a digital copy of the book, for $10 you can get your hands on a physical copy, or $12 for the digital version of Wrestlers In Space and my previous comic The Vagabond. 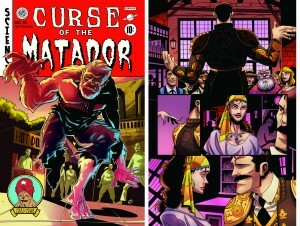 All digital content will be available through comiXology which has been a great contribution for the campaign. CAC: What inspired the creation of Wrestlers in Space? 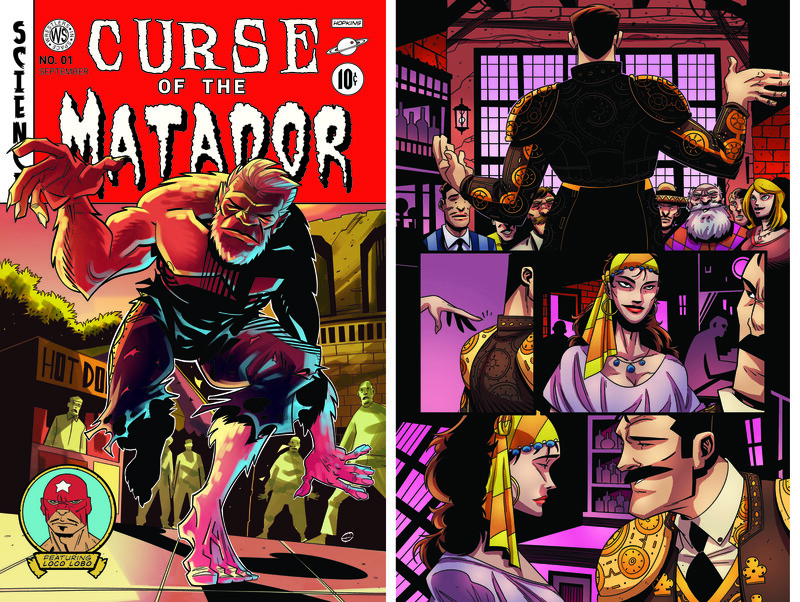 The series’ concept seemingly heralds back to the luchador films of yesteryear that featured the likes of El Santo, Blue Demon, and Mil Máscaras. NHS: Funnily enough, the idea behind Wrestlers In Space came to me when my brother and I (co-creator of The Vagabond) were playing Tekken on the Playstation, we had both picked the two wrestling characters “King” and “Craig Marduk” each time we played these characters on the moon/space stage we would yell out “Wrestlers in Spaaaaaaace….” in the same tune as the old “Pigs in Space” skit from The Muppets. I actually wanted to produce and shoot Wrestlers In Space into a Muppet style show, but I figured like The Vagabond I could take the idea much further as a comic. CAC: There’s been something of an explosion in pro wrestling of late including the television series Lucha Underground on Robert Rodriguez’s El Rey Network and Jeff Jarrett’s Global Force Wrestling (which has contracts with international powerhouses like Mexico’s AAA and Japan’s NJPW). In the comic book world, you also have books like Headlocked: The Last Territory, Super Genius’ WWE comics, and Image’s upcoming series Ringside. What are your thoughts on this wrestling resurgence and the relationship wrestling has with the comic book world? NHS: Wrestling has always been pretty big in U.S.A and Australia, I think comics and wrestling posses similar traits, most prominently would be the hero/villain dynamic, I think people love having someone to root for whether it’s the hero or the villain. Luchadores in particular, I’ve noticed, have really come up in trend as of late. This was one of the deciding factors in releasing this book earlier than I expected. A lot of people encouraged me to finish The Vagabond first, but I felt it was necessary to bring out the Wrestlers in Space story, in case someone beat me to the punch. 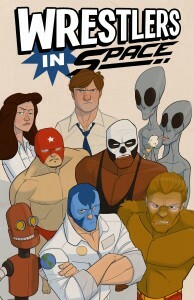 To check out Wrestlers in Space and pledge toward its publication, go to its Kickstarter campaign. You can also follow the series on Twitter and like it on Facebook. 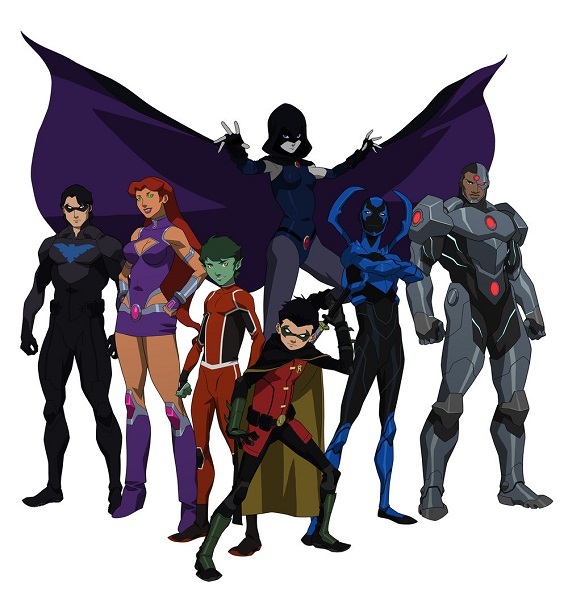 Young Justice – Apokolips: We Want You!